Last week, after wiping the snot from my face following a twenty minute session of both sobbing uncontrollably and laughing like a maniac, I finally managed to read through the entire email telling me that my little blog here is a finalist for the Saveur 2015 Blog Awards in the best new voice category. This space here, which is not even a year old, is up for an award? Is this really happening? Eeeeeek! One year ago, let's see...I had just left my job in Chicago and was in the middle of a harried apartment search in New York, getting rejected one too many times. My hair was on fire, I thought we'd be homeless, and creating a food blog was the furthest thing from my mind. If you would have asked last-year-me what this-year-me would be doing, I would have said something along the lines of "have a soulless cushy job in consulting (what I had been doing), and eating at the Chef's Table at Brooklyn Fare (cause I'm so fancy)." Instead, I started a food blog and took a six month hiatus from office life; it turned out to be something I now pour my heart and soul into everyday. I did land another corporate gig, but left that after four months because nope, just nope, and now I'm broke as a college kid because I decided to go back to school and transition into an entirely different career path (I'm going to be a web developer!). Sometimes it all seems so overwhelming, but I'm doing what I love everyday, I'm happy, it's worth it. And before we move on to the rest of this post, I need to thank you. All of you. You guys and your overwhelming support mean the world to me, and I'm so honored to be a part of this amazing food community. Anyways, enough mushy talk about life and emotions. 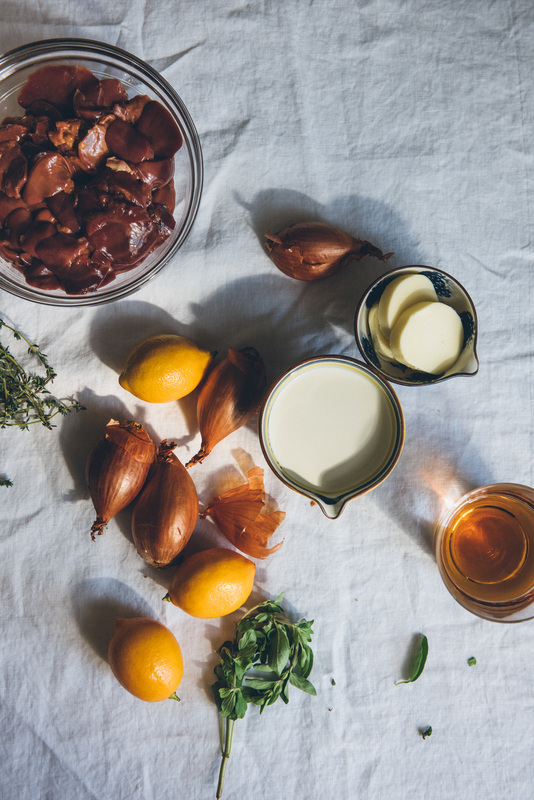 It's time for chicken liver mousse, which, I promise you, is not as pretentious or fancy (or disgusting, depending on your point of view) as it sounds. Actually, let's back up and talk about offal for a minute. I grew up in a Chinese household and by extension grew up eating every animal part under the sun: liver, heart, kidney, stomach, feet, tendon. The only thing my parents never really exposed my brother and I to was intestines, because according to my mom, they were too difficult to clean. However about five years ago when I went backpacking through western China with a group of people who I barely knew, we stayed at a semi shabby BnB-ish kind of place and in the morning, we woke up to the owner making us pig intestine soup and homemade bread for breakfast. It was one of the most amazing soups I have ever eaten to this day. There were no funky smells or tastes, it was simply fatty, rich, and delicious. So my point is, offal is great, you should try it if you haven't already, or eat more of it if you have. With that said, chicken liver mousse, the gateway to offal as some people call it, is the best offal of them all. It is sweet, savory, rich, and a little funky all at the same time. It takes no time at all to put together, and the worst part is the long wait while it chills in the fridge to firm up and let the flavors meld. 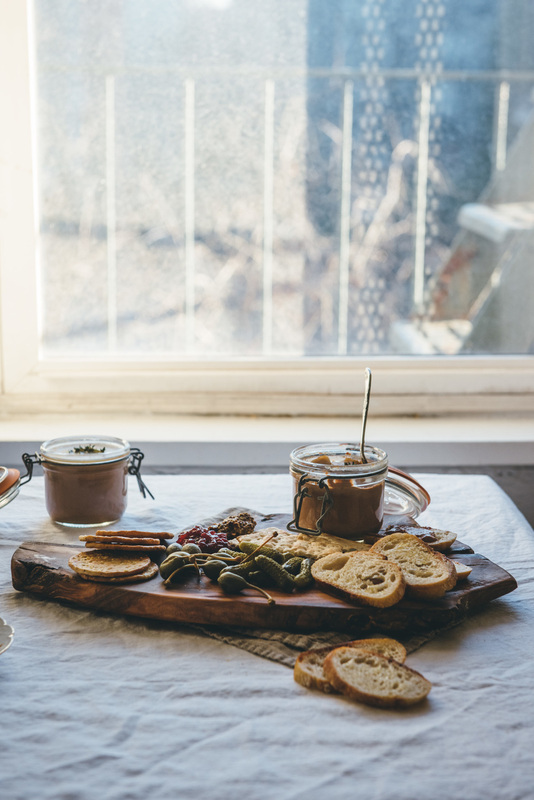 You serve it like you would any other charcuterie, with a variety of fancy schmancy accompaniments, and you have an appetizer/snack that would make your stomach proud. Salt and pepper the chicken livers. Heat canola oil or chicken fat in a large, heavy-bottomed pan over medium high heat. Add shallots, thyme, and marjoram, cook for 1 to 2 minutes until the shallots are translucent and fragrant. Add the chicken livers and cook for 1 to 2 minutes per side until the outside is brown, but the inside still pink. You can test this by poking them with your finger, like a steak, they should feel very tender and not rubbery. Transfer the entire contents of the pan to a bowl. Return the pan to the stove, still on medium high heat, and add cognac and lemon zest. Let the mixture reduce down by about half then transfer it to the same bowl containing the chicken livers. Let the liver mixture cool for about 15 minutes before transferring to a blender or food processor. Blend the livers for 1 minute before slowly adding in the heavy cream and melted butter. Blend until smooth, taste, and add more salt as needed. If you want a super smooth mousse, press the mixture through a fine mesh sieve (I didn't), then divide evenly between a few jars. Cover each jar with plastic wrap, pressing it to the mousse to keep it from oxidizing. Refrigerate for at least 3 hours. If not enjoying immediately, top each jar of mousse with a thin layer of olive oil or melted clarified butter, and store in the fridge for up to 1 week. If you are storing with a layer of butter, I suggest letting the mousse come to room temperature before serving so the butter blends in better.